One female Job Service manager resigned in District 5 and that position has not been filled. There were no minority hires or promotions into the administrator category. Utilization of women and minority groups in administrators indicate a need for corrective action. Professionals have decreased this year from 570 to 565. Females have decreased 20 positions while males have increased 15 positions. Job Service is underutilized by 3.12 females. 193 females are located in the various local offices. The administrative office has 70 female professionals. Professional females in the administrative office are underutilized by 27.03. Total professional minorities increased this year from 22 to 25. Minorities were promoted in IPERS and Districts 6, 8, and 11. The Internal Security unit of Staff Services hired a minority investigator. 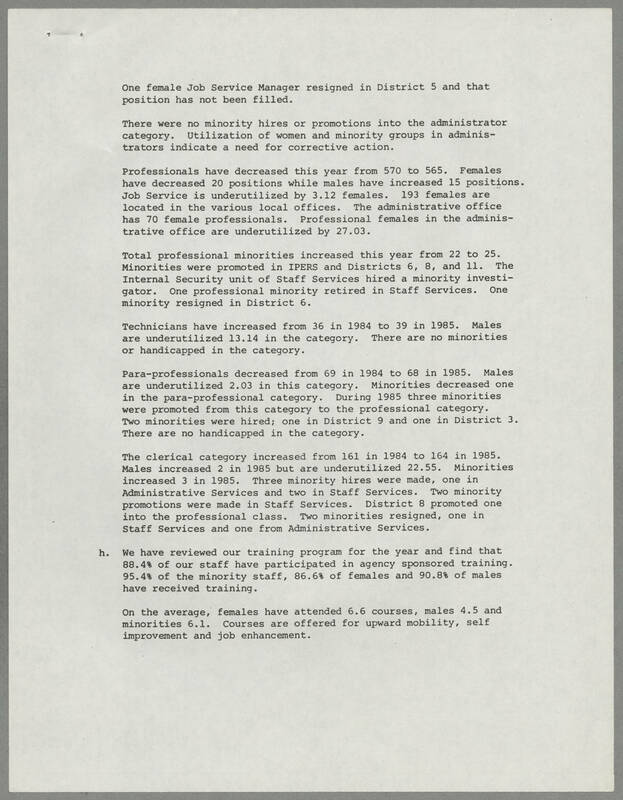 One professional minority retired in Staff Services. One minority resigned in District 6. Technicians have increased from 36 in 1984 to 39 in 1985. Males are underutilized 13.14 in the category. There are no minorities or handicapped in the category. The clerical category increased from 161 in 1984 to 164 in 1985. Males increased 2 in 1985 but are underutilized 22.55. Minorities increased 3 in 1985. Three minority hires were made, one in Administrative Services and two in Staff Services. Two minority promotions were made in Staff Services. District 8 promoted one into the professional class. Two minorities resigned, one in Staff Services and one from Administrative Services. We have reviewed our training program for the year and find that 88.4% of our staff have participated in agency sponsored training. 95.4% of the minority staff, 86.6% of the females, and 90.8% of males have received training. On the average, females have attended 6.6 courses, males 4.5 and minorities 6.1. Courses are offered for upward mobility, self improvement and job enhancement.